That's it, 2007 is over. The brakes are on, the roller coaster has come to a complete stop, seat belts are off and we can get ready to sit back and click off the Dow points next year. If only it was that easy; however, 2007 wasn't all bad. The S&P 500 finished up 3.5%. AAPL added the most index points (11.06) with XOM slightly second adding 10.75 (GOOG was third adding only 5.89). C stripped the most points off the index, -14.74 during the year, with BAC second accounting for -6.1. 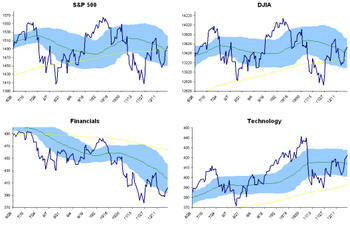 In the end the S&P 500 gained 50 index points, thanks mostly to energy and technology. The energy sector finished the year up over 32.4%, nearly doubling every other sector's gains. The big winners were the Oil Equipment and Services (RIG, HAL, SLB and BHI to name a few), the group was up 45.4%. Banks were the losers (C, WM and other familiars), down over 32.5%. WaMu up 4.1% and FNM up 4.3% suggests value plays for the new year, but who are we to speculate? 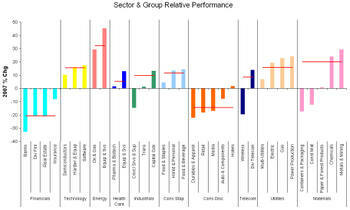 The table below details major S&P 500 sector and group performance for the year. Birinyi Associates' annual international outlook piece is in the works and scheduled for publication on Wednesday, January 9th. Are you interested in the stocks recommended the most this quarter, or how the most poplar stocks from 2006 faired during 2007? Currently analysts are forecasting a 14.4% gain in the S&P 500 for next year; 31% of that gain will come from the top 20 stocks. 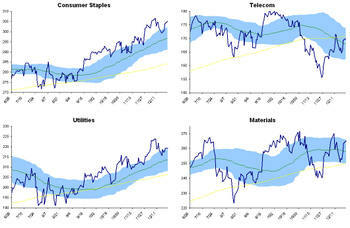 Earnings are expected to gain 15% next year, and one sector is expected to gain 25% during 2008. Birinyi Associates puts the information you need in your hands; not what we like, not how we feel, but what we know and what The Street is saying. To learn more about Birinyi services, and for subscription information click here. 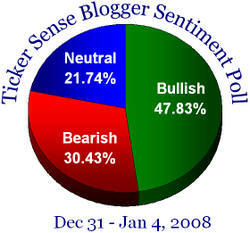 This week's poll continues the bullish trend going into the new year. The United States oil imports average 5.6 million barrels per day in October. 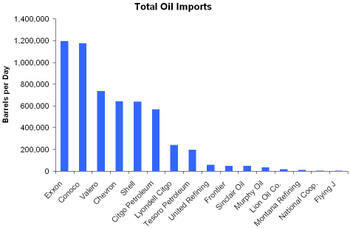 The charts below detail oil imports in barrels per day by American oil companies and where the oil came from. Exxon Mobil was the country's largest oil importer (21.3% of the total), followed closely by ConocoPhillips (20.9% of the total). 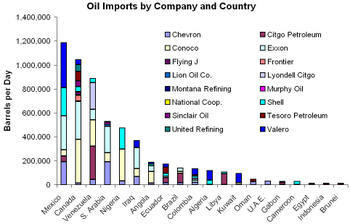 Most of the country's oil came from Mexico (21.1% of the total) and the second most from Canada (15.8% of the total). In terms of sustained gains, the Dow Jones Industrial average peaked in late May. 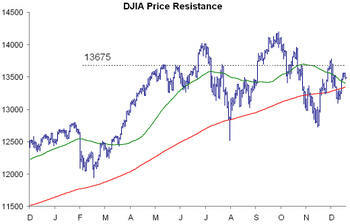 Since then it has had two pushes towards and above 14,000, but after each gain the Dow disappointed with a significant correction. Looking back now at these moves, the 13,675 level appears to be significant. The reason, probably pure coincidence, is unknown; although several gains above 13,675 have been significant moves and the declines even more so. As part of the Birinyi Newsletter service, subscribers receive access to three investment portfolios based on conservative, growth and trading strategies. These portfolios are maintained by analysts at Birinyi Associates and updated monthly when changes are required. The performance numbers highlighted below assume that 100 shares were invested in each stock, thus a $2 stock that moved to $3 could not create illusions of greatness. Follow one of the links on the left side of this page to subscribe either for one month or a year at a discounted rate. 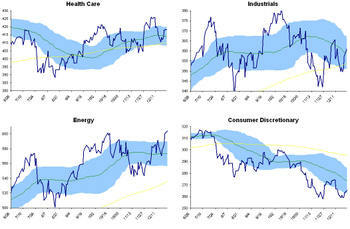 All ten S&P 500 sectors are either neutral or overbought, the Dow and S&P are both seated above their moving averages, the financial sector could have bottomed although Consumer Staples, Utilities, and Tech seem to remain the top sectors (energy up 32% for the year might be ready for consolidation). 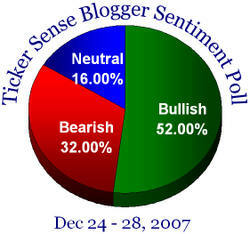 Some holiday cheer has spread from the markets into the poll. 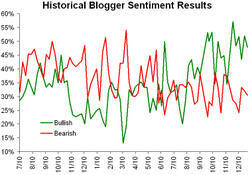 Bloggers continue to be bullish. Laszlo Birinyi is featured as one of only six market strategists in BusinessWeek's annual outlook. Click here to read the story and see what Mr. Birinyi thinks about the year ahead. After reporting strong earnings and issuing positive guidance RIMM gapped up 13% this morning to $121.00. 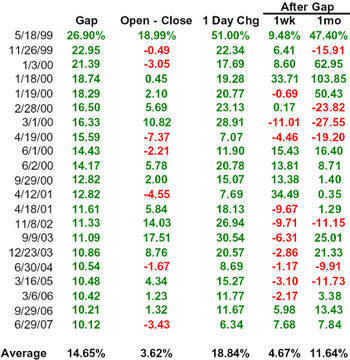 The table below highlights similar gaps for RIMM and shows that on average the stock trades up 3.62% open to close and was up 67% of the time.